Born Pretty Store was kind enough to let me check out 3 more products. First up, their leaf and square shaped Pastel Studs or as they like to call it "Hot-sell 300Pcs Mini Square Leaf Round Shape Candy Colored Stud Rhinestone Nail Art Decoration w/box". They come in 4 sets: (1) Neon Leaf and Square Studs (2) Pastel Leaf and Square Studs (3) Pastel Leaf and Circle Studs and (4) Neon Leaf and Round Studs. I chose #2 because I like pastels and I wanted the leaf shape studs. 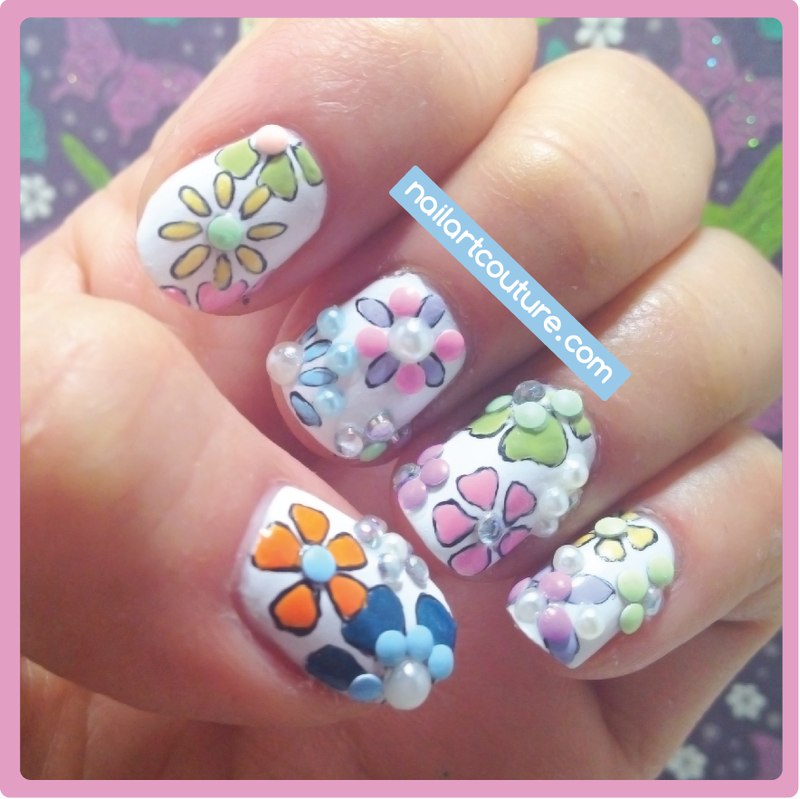 If you love working with little nail art decor, this would be an excellent addition. They currently sell for $7.59 US for 1, but if you buy 5+ or 10+, you get a nice discount. Of course, if you use my code: NVL91 you can save an additional 10%! As always, it is free shipping! 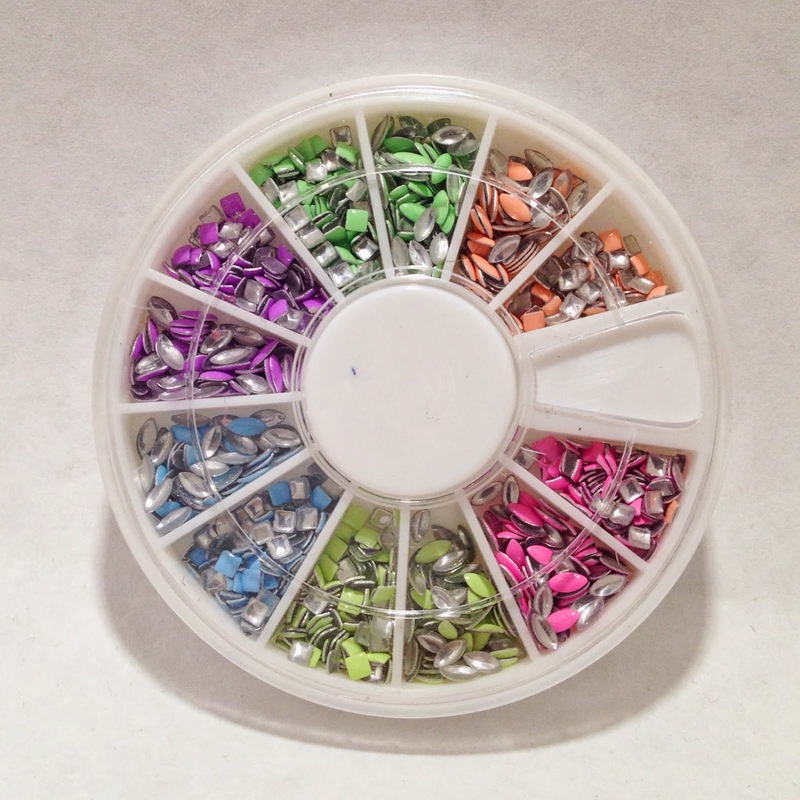 In this box of studs, you 300 pieces in 6 colours of square and leaf shaped studs. It comes in Pink, Yellow, Blue, Purple, Green, and Orange. So you can definitely have a lot of fun with these! I decided to create a Floral Grid Nail Art, for some reason it reminds me of Tron. In order to have these studs really stick and stay on your nail, you want to immerse the stud into top coat and use a tweezer to to place it on your nail. Check out the tutorial after the jump! I can't believe another Olympic event has come and gone. Personally, I enjoy watching summer sports a lot more. As for Winter Olympics, I definitely couldn't miss figure skating and hockey. I definitely woke up early today to catch the 7 AM Canada versus Sweden game. As much as I wanted to go and watch it with my fellow proud Canadians at a bar, watching the game in the comfort of my warm bed just seemed more appealing. Nonetheless, I am so happy we dominated that game! Like Gymnastics, figure skating and ice dancing are known for their lovely costumes. Vera Wang was a former figure skater, who designed costumes for skaters like Nancy Kerrigan. Christian Lacroix also designed couture skating outfits as well! 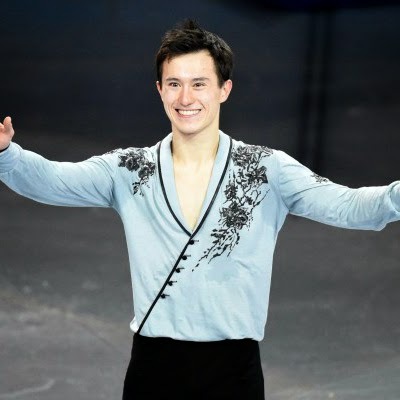 But for an elite skater, I read they could easily spend $10,000 a year on costume alone. Anyways, I was inspired by these designs just like I did with the Gymnastic Costumes in the Summer Olympics. I tried to pick outfits that had the same colour theme and I tried to fit in at least two Canadians! So here is what I came with below. On the thumb, the design was inspired by South Korean figure skater, So Youn Park. On the index figure, this simple design was inspired by ice dancer and Canadian sweetheart, Tessa Virtue. Tessa happens to be one of my University Residence Floormate's cousin, which is really cool! 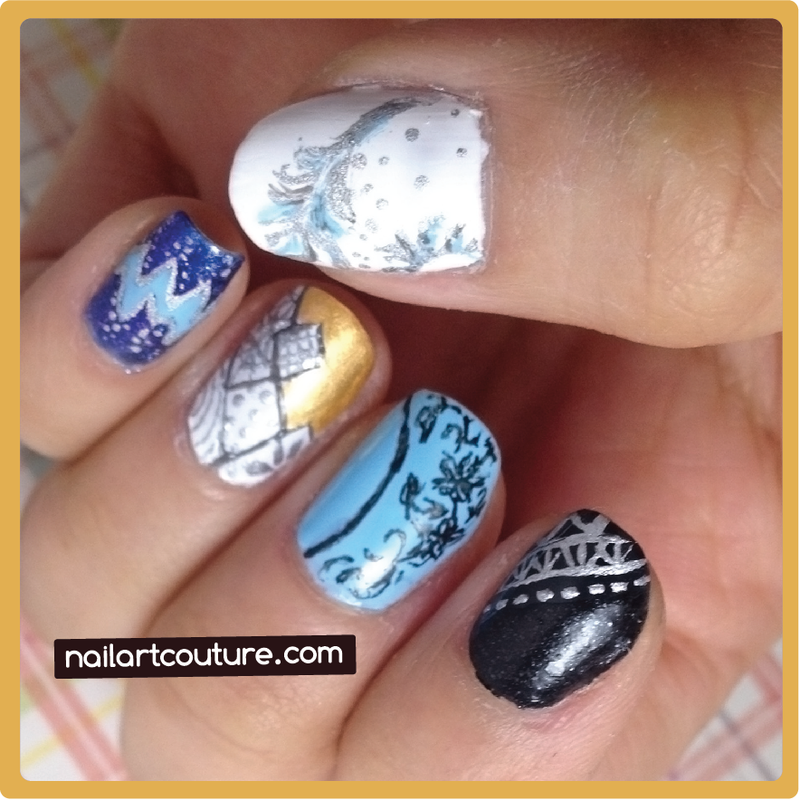 On the middle finger, I was inspired by Canadian figure skater, Patrick Chan. 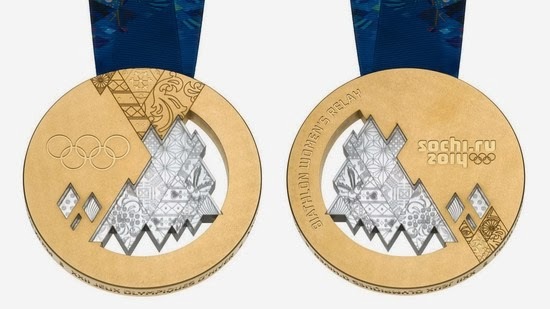 On the ring finger, the design was inspired by the Olympic medals. I chose to Gold Medal specifically for obvious reasons! I absolutely love the detailed patchwork theme used throughout the Olympics. I tried to simplify it, while remaining true to the design, for my tiny nails. Finally the design on the pinky was inspired by Russian figure skater, Yulia Lipnitskaya. It makes me feel so old to know that some of these Olympians and medalists are as young as 15! For materials used, check out after the jump! Happy February everyone! I can't believe we're onto month number 2 already. For this post, I will be reviewing Born Pretty Store's "400pcs 2mm Round Square Fluorescent Lighter Colors Stud Rhinestones Nail Art Decoration with box". Apparently these studs are a pretty hot sellers because the darker version were sold out! I placed my request a while ago and the package came within 2 and a half weeks. Born Pretty Store is a great place to get all the supplies because it is affordable, they have a huge variety, and it's free international shipping with no minimum order!